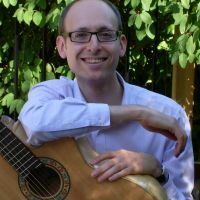 I'm a singer-songwriter and classically trained guitarist based in Barnet, Hertfordshire with a passion for music. I have been writing contemporary songs for the past nine years and have played the guitar for over thirty-five. My songs have received an enthusiastic response from audiences as they have catchy, melodic tunes with sincere, heartfelt lyrics - sharing the relaxed style of artists such as Katie Melua and Yael Naim. I have previously performed in musicals (with West End musical and BBC comedy directors), comedy revue (writing eighty topical, satirical songs and sketches) and four-part harmony choir, including numerous performances at The Bloomsbury Theatre, Mermaid Theatre, Arts Depot and Burgh House in London, and for the past eleven years, I have been singing with a piano accompanist and with my guitar.